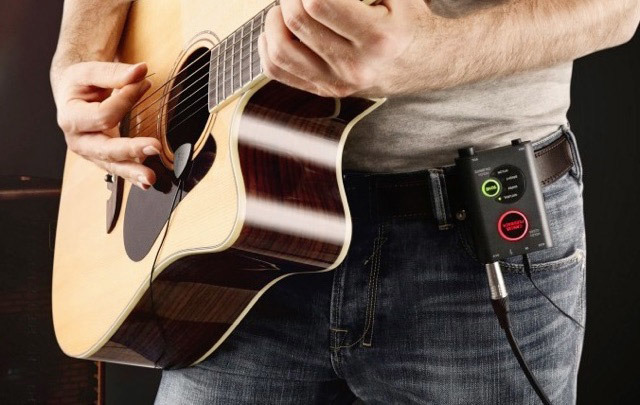 IK Multimedia on Wednesday launched two new interfaces for musicians in the iRig Pro I/O, a compact audio and MIDI interface with Lightning connectivity straight from the box, and the iRig Acoustic Stage digital microphone system for acoustic guitars. 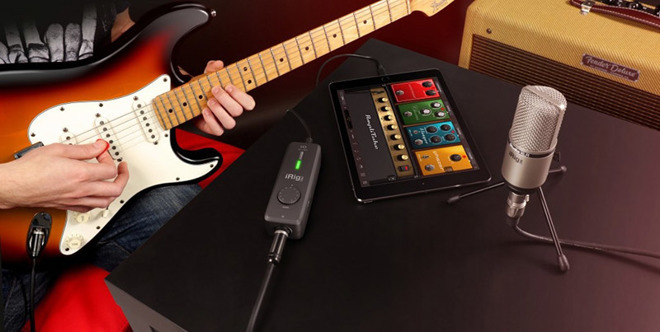 The iRig Pro I/O follows on from the iRig HD 2 and the iRig Pro as a small audio and MIDI interface for connecting instruments and microphones to iPhones, iPads, and Macs. Capable of recording 24-bit audio at a sample rate of up to 96kHz, the unit includes a preamp with an input gain control dial for fine-tuning the audio signal. On the same panel is a multi-color LED indicator, advising the musician of the gain level and warning if clipping takes place. MIDI input and output ports are offered for use with MIDI keyboards, controllers, and other modules, and a combo XLR and 1/4-inch input can take dynamic and condenser microphones, and line-level instruments, as well as items requiring phantom power. A 1/8-inch headphone and line output is also included for use with headphones or speakers. The unit is supplied with two MIDI cables, as well as Mini-DIN-to-USB for connecting to Macs, and Mini-DIN-to-Lightning for use with iOS devices. Power can be supplied over USB when connected to a Mac, but when used with an iPhone or iPad on the move, it accepts two AA batteries. An optional 5.4V DC power supply will not only power the interface, but also charge the connected iOS device, allowing it to be used for an extended recording session. A number of IK Software titles are supplied with the iRIG Pro I/O, valued at over $500. The list of software includes SampleTank 3 SD, T-RackS Deluxe with Mic room, AmpliTube for iOS, and AmpliTube 4 for Mac, among other additions. The iRig Pro I/O is shipping in April for $149.99. The iRig Acoustic Stage is a microphone, preamp, and digital processor system for the acoustic guitar and other acoustic instruments. Once the MEMS microphone is clipped to the instrument's sound hole, sound is fed into the main unit, consisting of a pre-amplifier and a digital processor, before being fed out to a mixer, amplifier, or to a recording device. Sound from the guitar is analyzed by the 32-bit digital processor, with the sound, nuance of the instrument, and playing technique used to build an optimum tone profile, said to create a warm and balanced sound. The tone profile can be enhanced further using six presets, three each for steel string and nylon string instruments. Aside from the supplied microphone, an auxiliary input with a mix knob allows it to be used with an acoustic electric guitar's onboard piezo or magnetic pickup, with the knob allowing for sound from the microphone to blend with it. As with many other iRig products, the iRig Acoustic Stage includes audio output over USB, allowing it to be recorded on a Mac or iOS device. Unlike the iRig Pro I/O, it does require the use of the Lightning-to-USB Camera Adapter to connect to an iPhone or iPad. The iRig Acoustic Stage sells for $99.99 and is available to buy now.